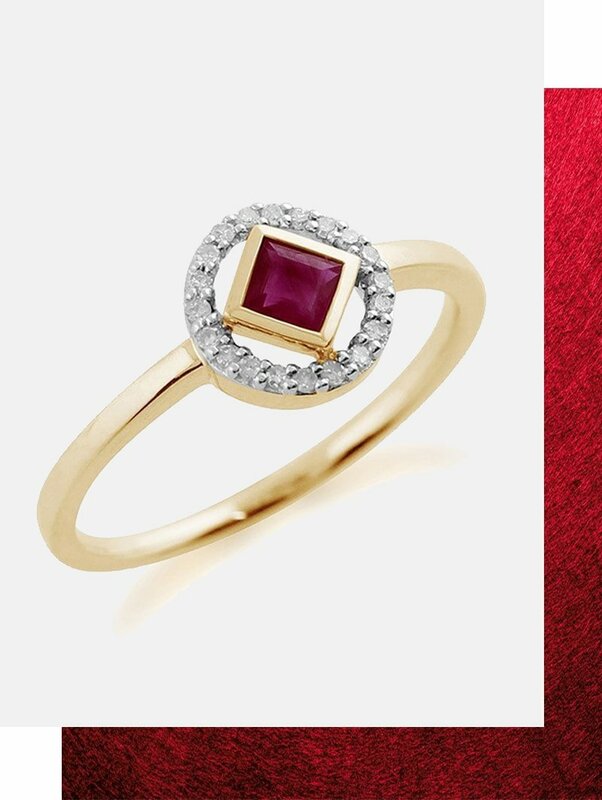 Considered the king of gems, Rubies are the birthstone for July babies. 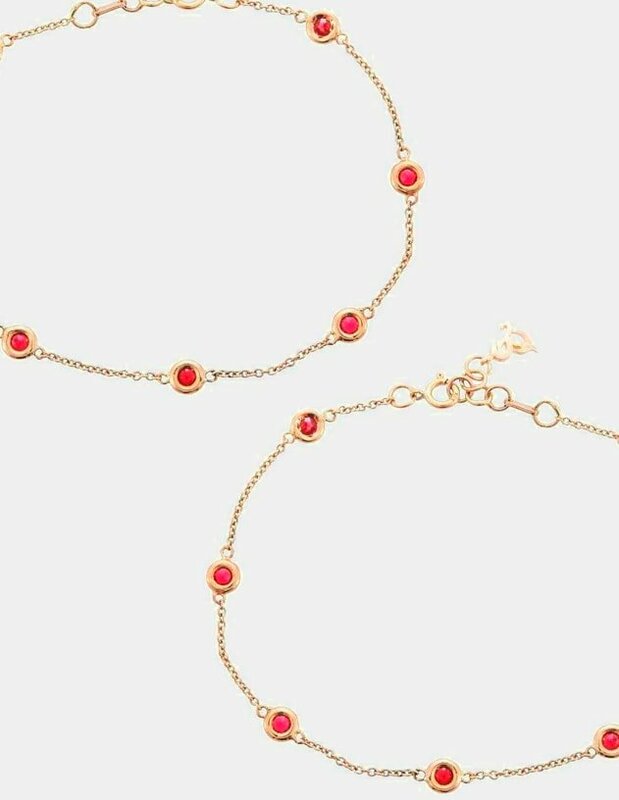 Wearing a red Ruby is believed to bring good fortune to its owner, making one the perfect gift for anyone born in July. Ruby is a precious gemstone known for its rich and opulent red hue. Commonly believed to represent love, health and wisdom, Ruby is easily the most coveted colored gemstone. 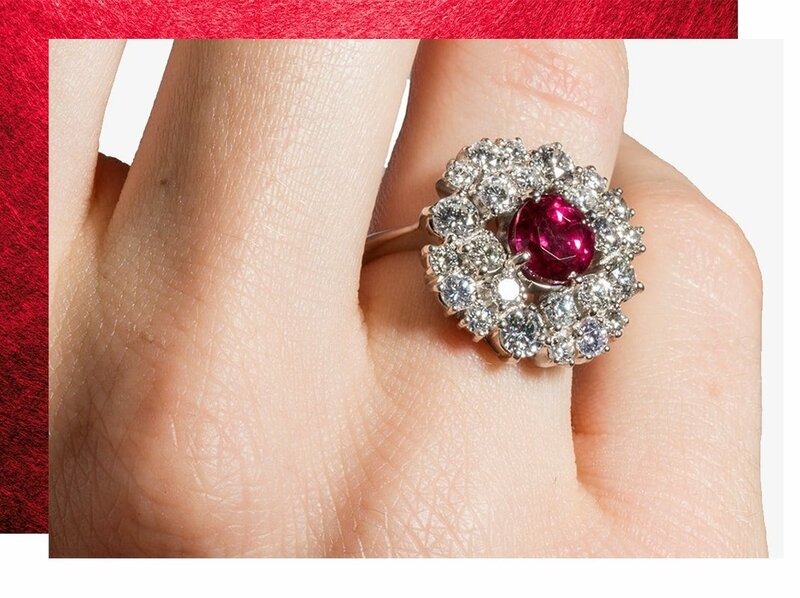 And with the highest per-carat price of any colored stone, Ruby is also one of the most valuable gemstones on earth. Ruby is one of the three gemstone varieties of the mineral corundum. The other two are the lesser-known and extremely rare padparadscha, and sapphire. Most Rubies come from Myanmar, Thailand and Sri Lanka. Striking yet simple, Syna’s jewelry is perfect teamed with casual daytime outfits or elegant evening wear. 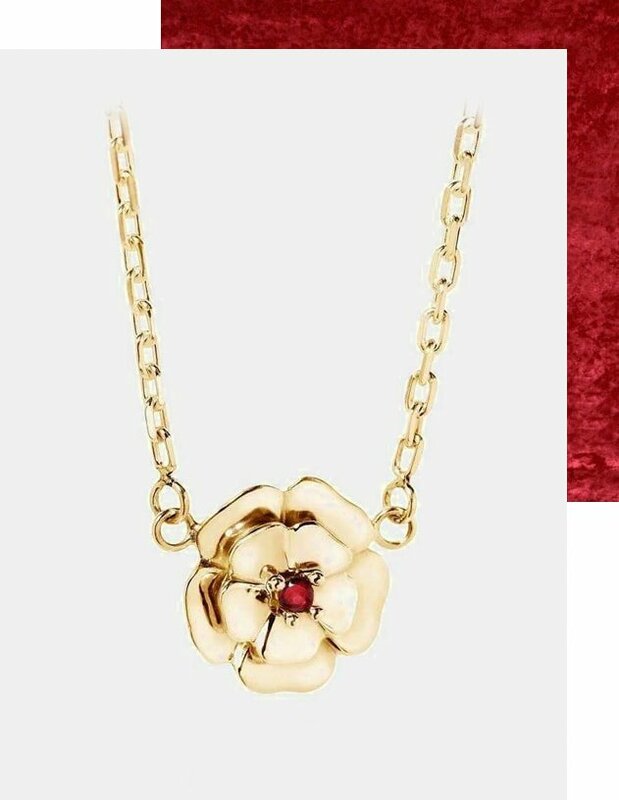 Inspired by the rich wildflower meadows of the Cotswolds, this 18kt Yellow Gold & Ruby necklace is delicate and sophisticated. Escape from the hustle and bustle of city life with this quintessentially English collection. 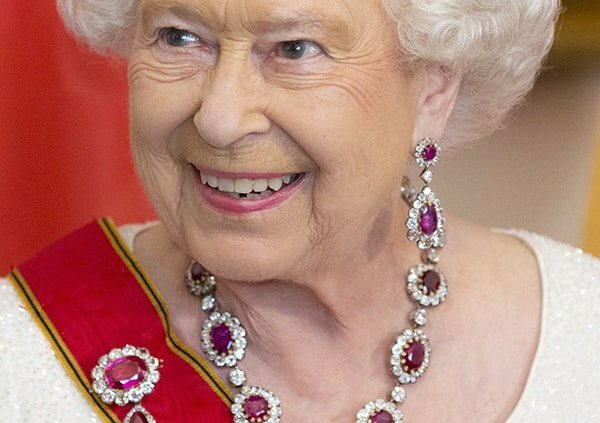 Rubies have been a highly regarded prized possession of kings and emperors throughout history. Early cultures treasured Rubies and believed they held the power of life due to their similarity to the color of blood. 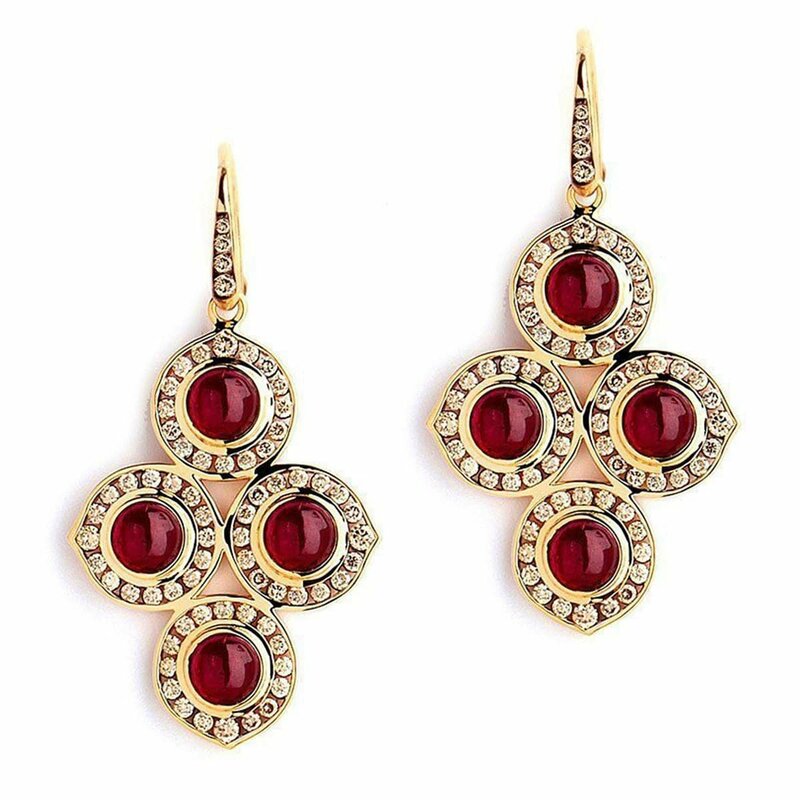 With their fiery red color, Rubies are also seen as symbols of love and passion. Second to diamonds in terms of hardness, the valuable stone is commonly linked with wealth, success and opulence. The great thing about studs is that they are the go-to earrings for every day, giving any ensemble a vibrant yet a sophisticated edge. 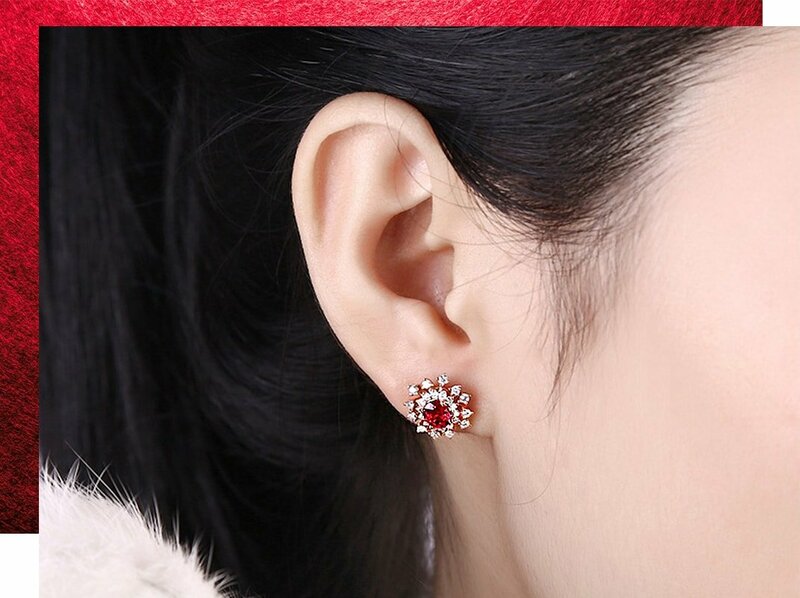 Ruby studs are also great for a day to night option whether you’re running around all day, meeting friends after work or going out for dinner. 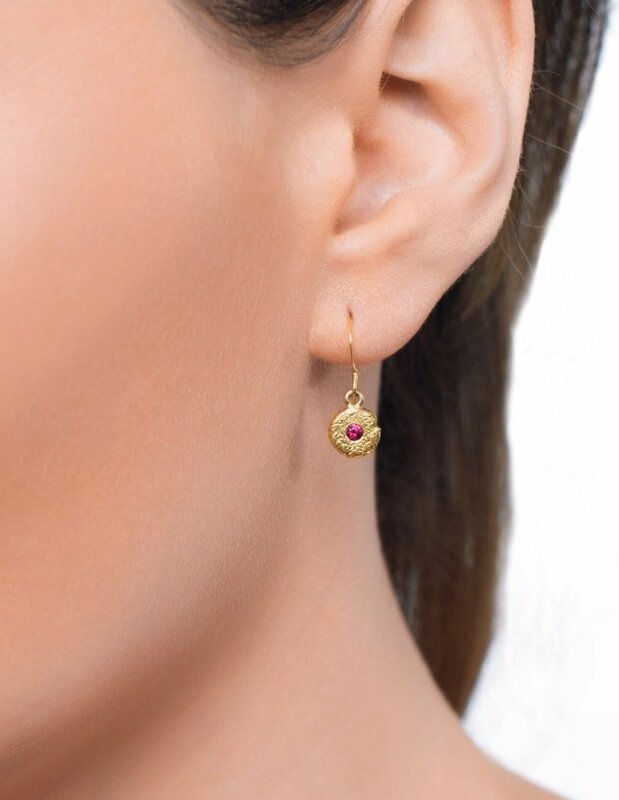 Vibrant and alluring, the studs made of pigeon blood cushion cut Rubies, mounted in 18kt rose gold with diamonds. The studs suit both daily wearing and for special occasions. 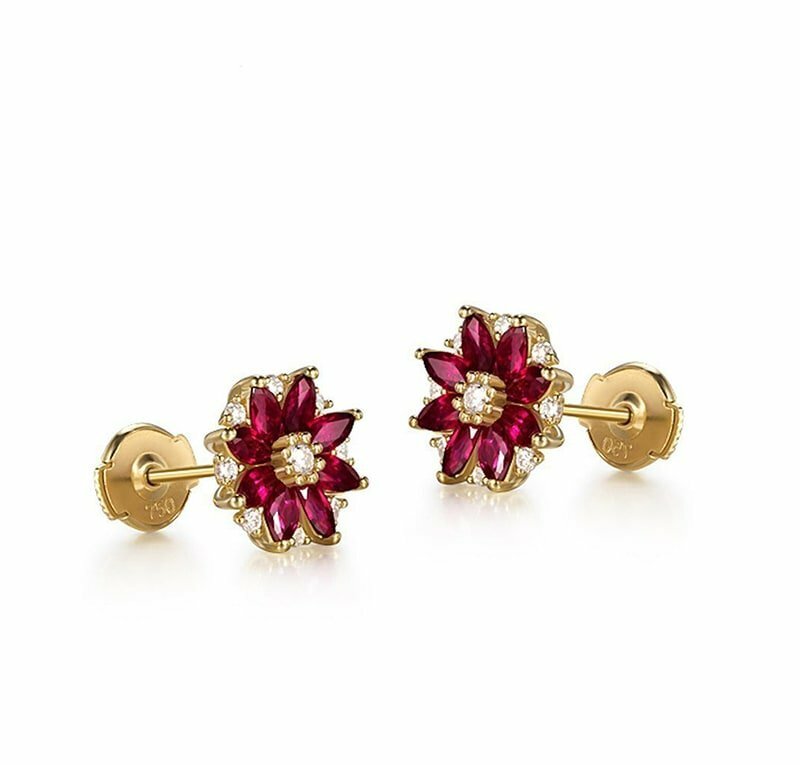 Vibrant and alluring, the studs made of marquise cut pigeon blood Rubies, mounted in 18kt yellow gold, decorated with F VVS brilliant cut diamonds, featuring push backs. These earrings suit any occasion. 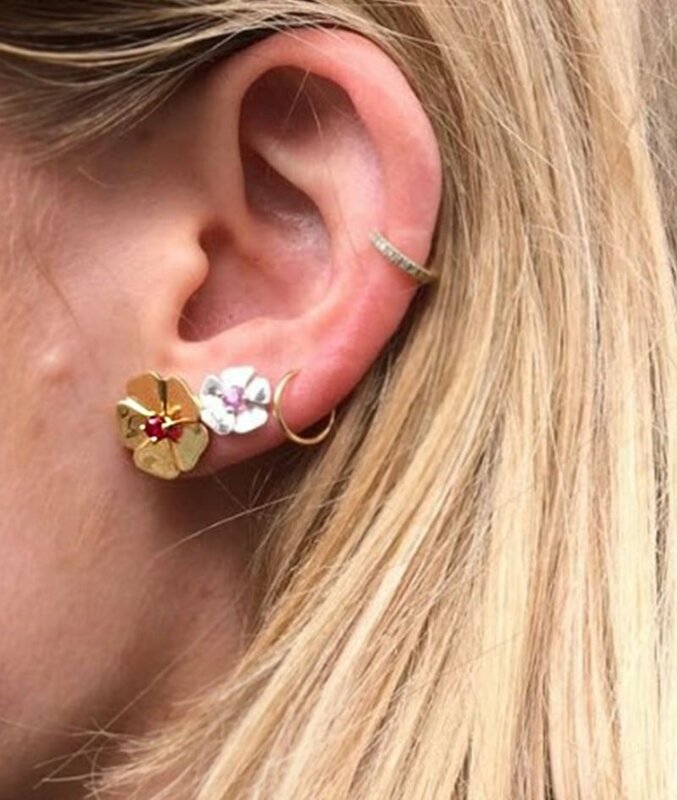 Inspired by the rich wildflower meadows of the Cotswolds, these solid 18kt yellow gold and Ruby earrings are delicate and sophisticated. Escape from the hustle and bustle of city life with this quintessentially English collection. 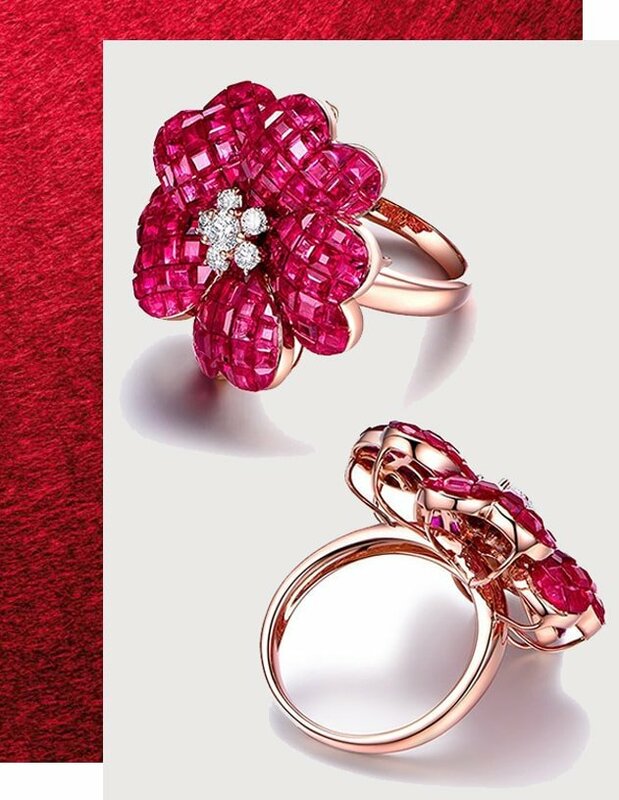 Ruby engagement rings symbolise long-lasting passion and affection. This gemstone is a poignant symbol of a loving, lifelong relationship. What are you waiting for? Make a unique proposal with our many variations of Ruby engagement rings. A Platinum ring with a double halo of diamonds surrounding a scintillating Burmese Ruby. Katherine Whipple, the designer behind jewelry brand Katherine LeGrand Custom Goldsmith, makes every one of her pieces from the ground up in Aspen, Colorado. She can draw inspiration from anywhere and everywhere – architecture, fabric, leaves, and much more. This Delphina Ring was made by taking an 18k Fairtrade gold nugget and flattening it to form an irregular circle. 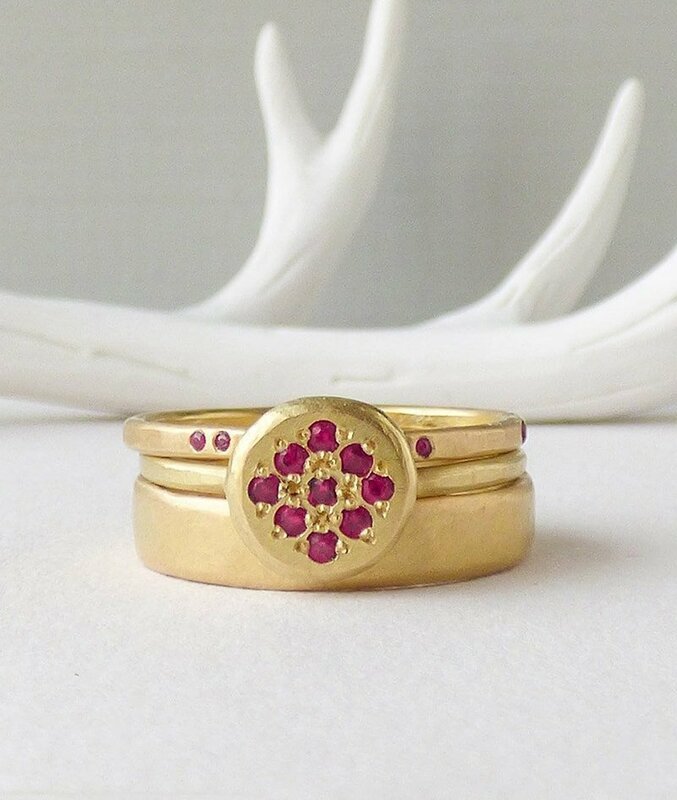 Nine fiery Rubies were then pave set within the circle that sits on top of a hammered band. A focal square cut red Ruby, a signifier of passion is haloed with diamonds to create a design that symbolises love and radiates beauty. 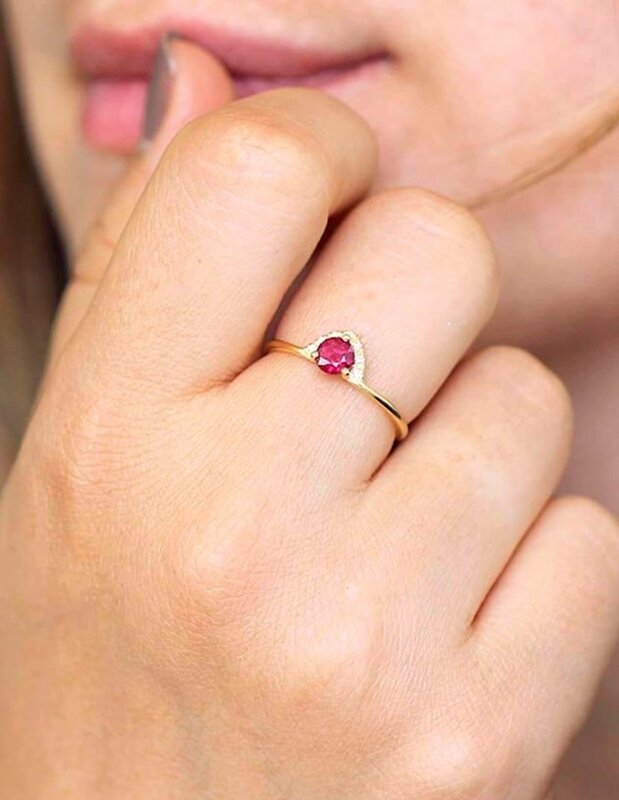 Diamonds are a girl's best friend but Rubies are unique. The stone's vibrant and intense color make it a stunning jewelry wear for special occasions.